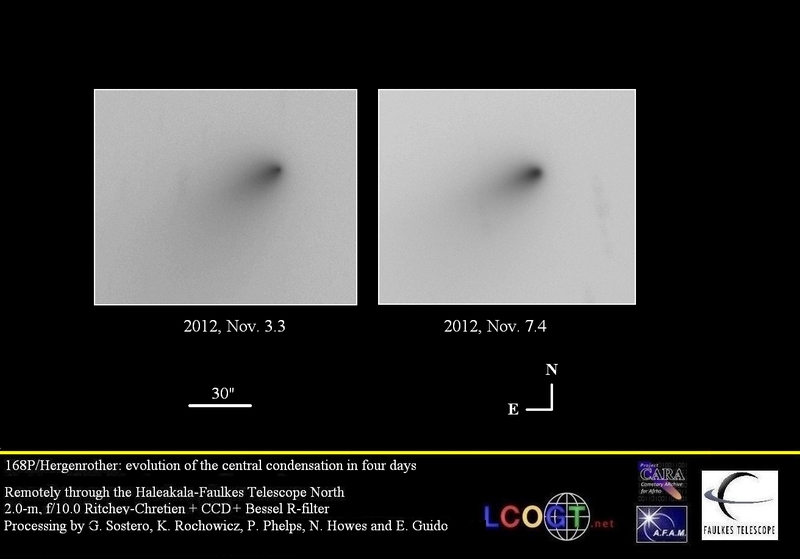 MPEC 2012-Y30, issued 2012 December 26, reports our recovery of comet 26P/Grigg–Skjellerup. We found the comet on 2012 December 05.6 and December 14.5 at about magnitude 20. 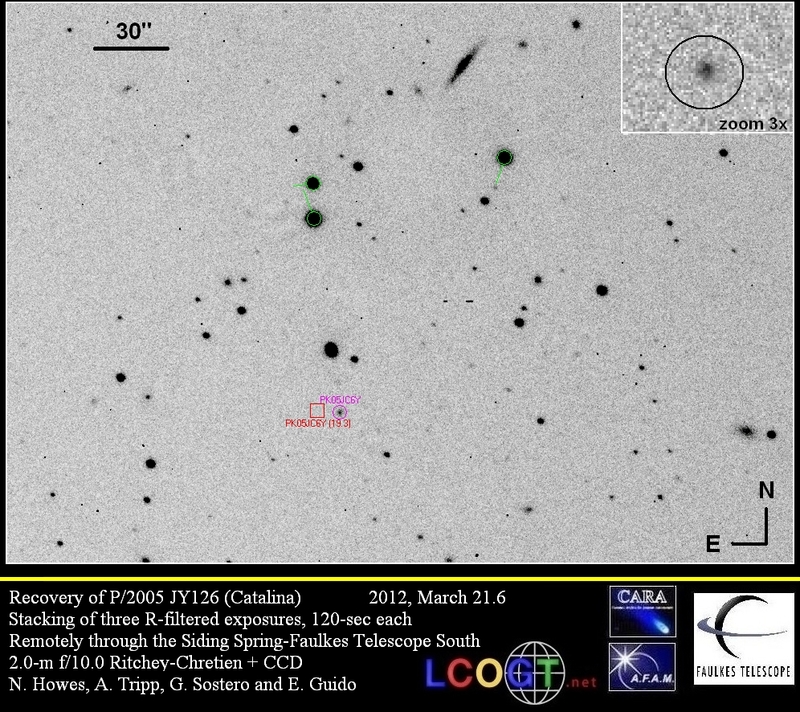 We imaged it remotely with the 2.0-m f/10 from the Siding Spring-Faulkes Telescope South. This comet is named after the singing teacher and amateur astronomer John Grigg and after J. Frank Skjellerup, an Australian telegraphist working at the Cape of Good Hope in South Africa. On July 10, 1992, comet 26P was visited by Giotto spacecraft after its successful close encounter with comet Halley. 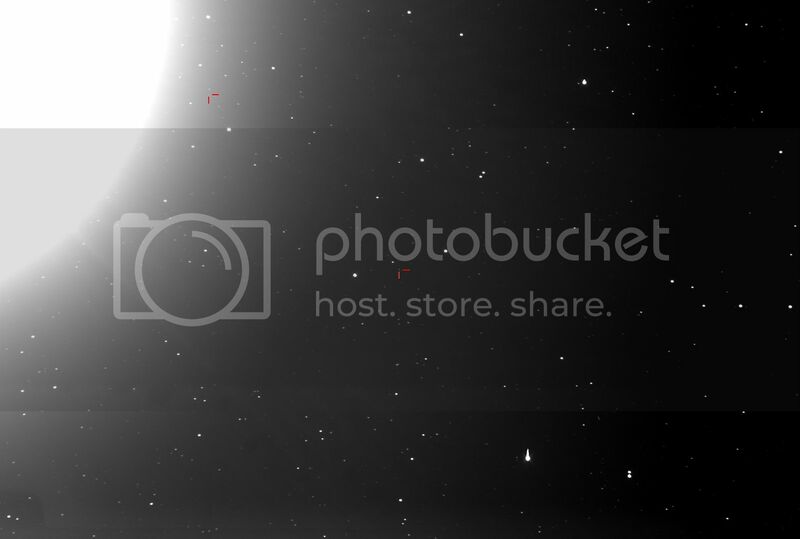 The Giotto camera has been damaged in the Halley flyby and there are no pictures of the nucleus. In 1972 the comet was discovered to produce a meteor shower (first predicted by Harold Ridley), the Pi Puppids, and its current orbit makes them peak around April 23, for observers in the southern hemisphere, best seen when the comet is near perihelion. 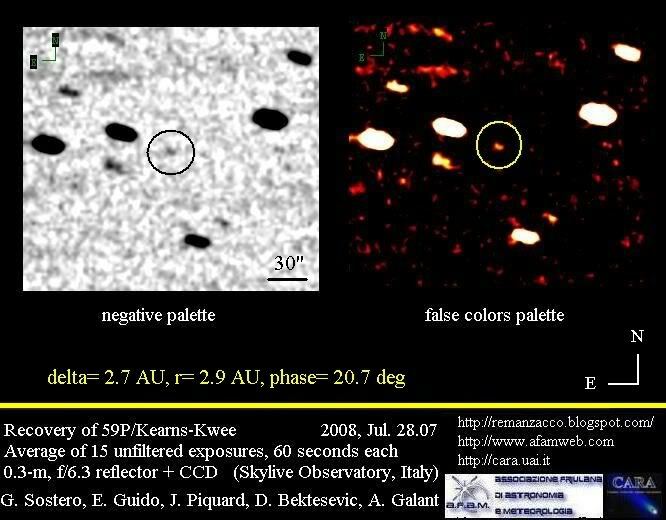 Comet 26P/Grigg–Skjellerup was last observed (before our recovery) on August 09, 2008 by mpc code 204 (Schiaparelli Observatory). 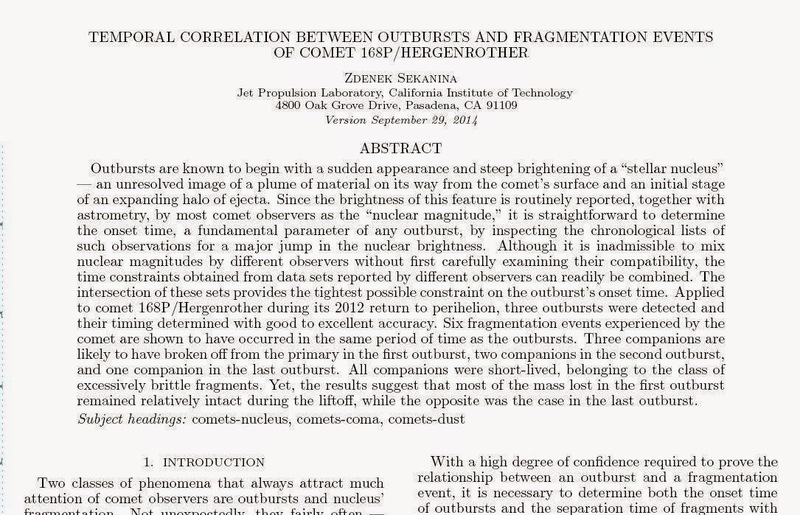 While there is also a single night observation by F51 – Pan-STARRS 1, Haleakala dated November 25, 2011, a comet recovery requires 2 nights of observations, "as it is not possible to unambiguously identify a comet by position and rate alone without a second night of data to verify the orbit." (Hainaut et al. A&A 1997). 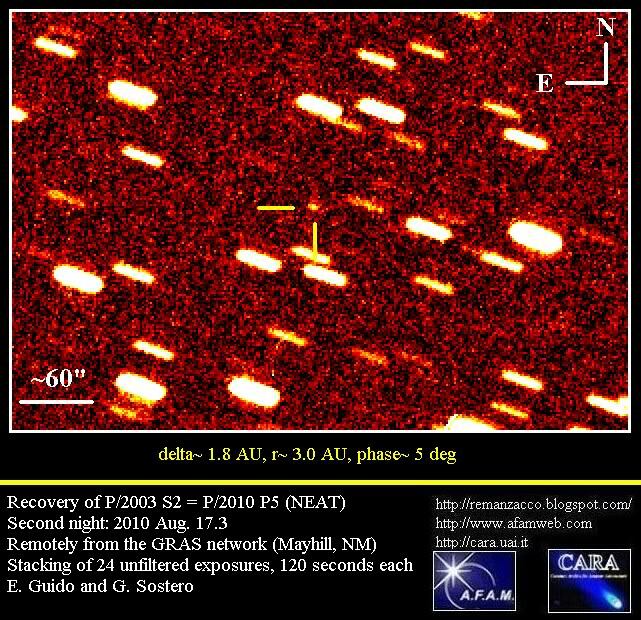 Asteroid (99942) Apophis was discovered on 2004 June 19 by R. A. Tucker, D. J. Tholen and F. Bernardi at Kitt Peak and then lost until it was serendipitously recovered in December of 2004. This Aten class asteroid, approximately 270 meters in diameter, caused a brief period of concern in December 2004 because initial observations indicated a small probability that it would strike the Earth in 2029. Thanks to additional observations, the 2029 threat was eventually ruled out. However, a possibility remained that during the 2029 close encounter with Earth, Apophis would pass through a gravitational keyhole, a precise region in space no more than about a 600 meters wide, that would set up a future impact on 2036. The principal source of uncertainty is the acceleration due to the Yarkovsky effect, a non-gravitational effect that is a function of the asteroid's rotation period, pole direction, thermal properties, mass, shape, and dimensions. So this asteroid continues to receive considerable attention from amateur and professional astronomers. Apophis became (on 2004) the first object rated level 2 on the Torino scale, and for only a short time it was subsequently upgraded to level 4, the record for highest Torino rating. Currently Apophis has been downgraded to 0 in the Torino scale (the currently highest-scaled objects are 2007 VK184 & 2011 AG5 at level 1). The following citation is from MPC 54567: "(99942) Apophis = 2004 MN4. Also known as Apep, the Destroyer, Apophis is the Egyptian god of evil and destruction who dwelled in eternal darkness. As a result of its passage within 40 000 km of the earth on 2029 Apr. 13, this minor planet will move from the Aten to the Apollo class." Apophis will make a very close Earth approach on April 13, 2029 at 2146UT when it will pass within 0.1 LD (Lunar Distances = ~384,000 kilometers) or 0.00025 AU (1 AU = ~150 million kilometers). This will be the closest approach by something this large currently known. During the 2029 approach, Apophis' brightness will peak at magnitude 3.3, so it will be visible to the naked eye. Before the 2029 encounter, Apophis will have a close approach with our planet on January 2013. Actually, (99942) Apophis will have a close approach with Earth at about 37.6 LD (Lunar Distances = ~384,000 kilometers) or 0.0967 AU (1 AU = ~150 million kilometers) at 1143 UT on Jan. 09, 2013. On that date, the asteroid will reach the magnitude ~15.8 while moving at ~ 3.49"/min. According to Giorgini et al. (2008), it's likely that radar astrometry in 2013 will shrink the uncertainties sufficiently to completely rule out an impact in the 2030s. We performed some follow-up measurements of this object just few weeks before its 2013 close approach, from the H06 ITelescope network (near Mayhill, NM) on 2012, Dec. 13.4, through a 0.25-m f/3.4 reflector + CCD. 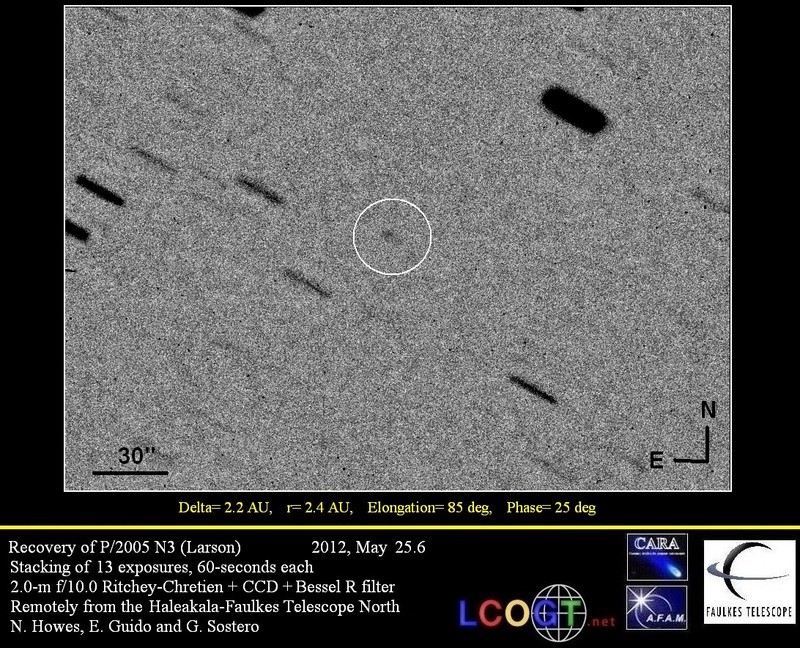 Below you can see our image, 19x30-second exposures, taken with the asteroid at magnitude ~17.5 and moving at ~2.57"/min. Click on the image below to see a bigger version. North is up, East is to the left. ESA’s Herschel space observatory made new observations of asteroid Apophis as it approached Earth this weekend. The data shows the asteroid to be bigger than first estimated, and less reflective. "Herschel provided the first thermal infrared observations of Apophis at different wavelengths, which together with optical measurements helped refine estimates of the asteroid’s properties. Previous estimates bracketed the asteroid’s average diameter at 270 ± 60 m; the new Herschel observations returned a more precise diameter of 325 ± 15 m". 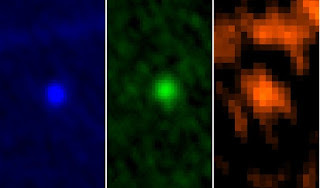 The image below shows the asteroid in Herschel’s three PACS wavelengths: 70, 100 and 160 microns, respectively (click on it for a bigger version). For more info about Herschel's find click here. After tracking asteroid 99942 Apophis with NASA's Goldstone radar dish, astronomers are now certain that the threatening asteroid has essentially no chance of striking Earth in 2036. See S&T article here for more details. 4179 Toutatis was discovered by C. Pollas at Caussols (France) on January 4, 1989. 4179 Toutatis was first sighted on February 10, 1934, as object 1934 CT, and then promptly lost. It remained a lost asteroid for several decades until it was discovered by Pollas. According to Minor Planet Circ. 16444: "Named after the Gaulish god, protector of the tribe. This totemic deity is well known because of the cartoon series "Les aventures d'Asterix" by Uderzo and Goscinny. This tells the stories of two almost fearless heroes living in the last village under siege in Roman-occupied Gaul in 50 B.C., and whose only fear is that the sky may fall onto their heads one day. Since this object is the Apollo object with the smallest inclination known, it is a good candidate to fall on our heads one of these days... But as the chief of the village always says: "C'est pas demain la veille..." Citation written by the discoverer and A. Maury and endorsed by J. D. Mulholland, who with Maury obtained the discovery plates." 4179 Toutatis is a highly irregular body consisting of two distinct "lobes", with maximum widths of about 4.5 km and 2.4 km respectively (4.5 × 2.4 × 1.9 km; absolute magnitude H=15.3) and it had a close approach with Earth at about 18 LD (Lunar Distances = ~384,000 kilometers) or 0.0463 AU (1 AU = ~150 million kilometers) at 0640 UT on Dec. 12, 2012. Its magnitude will be between 10.5 to 11 from December 11 through December 23, 2012. Moreover, Toutatis will be the target of a flyby by the Chinese Chang'e 2 spacecraft on December 13, 2012 Chang'e 2 was originally launched to study the Moon but was diverted in April, 2012 for the asteroid encounter. We performed some follow-up measurements of this object just few hours before its 2012 close approach, from the I89 iTelescope network (Nerpio, Spain) on 2012, Dec. 11.9, through a 0.15-m f/7.3 refractor + CCD. 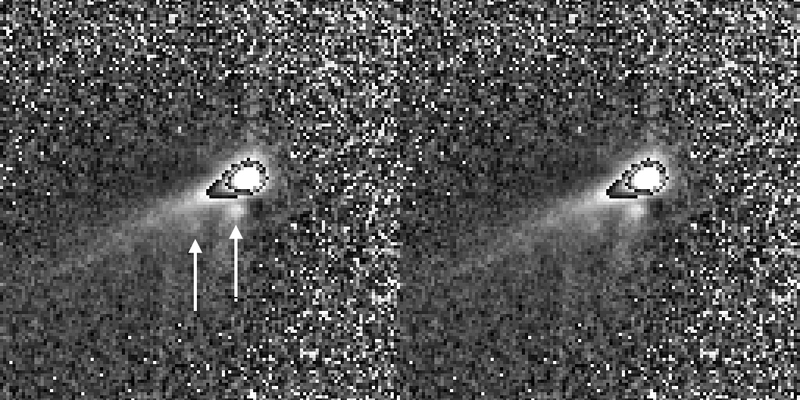 Below you can see our image, single 120-second exposure, taken with the asteroid at magnitude ~10.5 and moving at ~20.7"/min. The asteroid is trailed in the image due to its fast speed. At the moment of the close approach 4179 Toutatis will move at ~ 21.86"/min. Click on the image below to see a bigger version. North is up, East is to the left. Toutatis passes by Earth’s orbit roughly every 4 years. Four years ago it didn’t come quite so close (0.0502 AU). But four years before that (in September 2004) it missed us by just 0.0104 a.u., less than a quarter of its distance this time. The next notable close approach of Toutatis will be November 5, 2069, when the asteroid will fly by at a distance of only 0.0198 AU (7.7 lunar distances). See graphs below (click on it for bigger versions). Thanks to its proximity and size Toutatis was a strong target for radar imaging. Astronomers of NASA's Goldstone radar were tracking the asteroid as it passes by Earth and they obtained images of unprecedented clarity. Click on the image below for a bigger version. 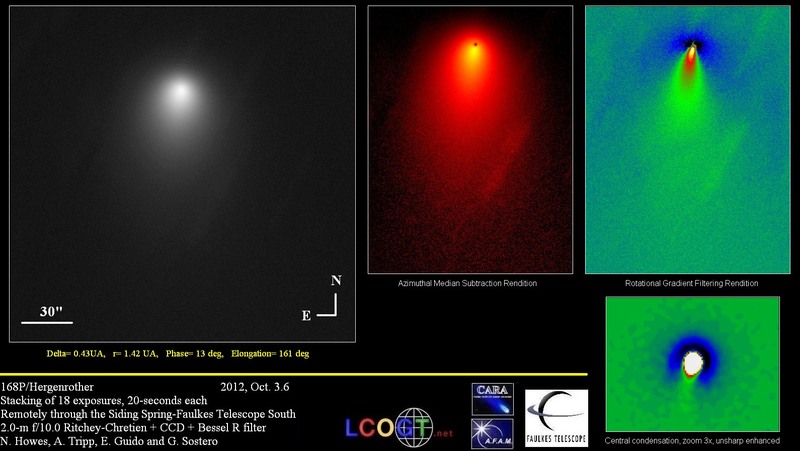 According to radar team member Michael Busch: "Toutatis appears to have a complicated internal structure. Our radar measurements are consistent with the asteroid's little lobe being ~15% denser than the big lobe; and they indicate 20% to 30% over-dense cores inside the two lobes.". This raises the interesting possibility that asteroid Toutatis is actually a mash up of smaller space rocks. "Toutatis could be re-accumulated debris from an asteroid-asteroid collision in the main belt," he says. 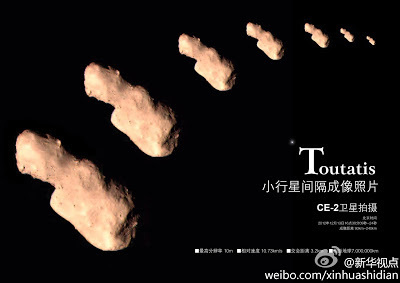 The Chinese Chang'e 2 spacecraft has successfully imaged Toutatis during his flyby on December 13, 2012. See image below captured at 93–240 km distance between 16:30:09–16:30:24, maximum resolution 10 meters/pixel. Click on the image for a bigger version. M.P.E.C. 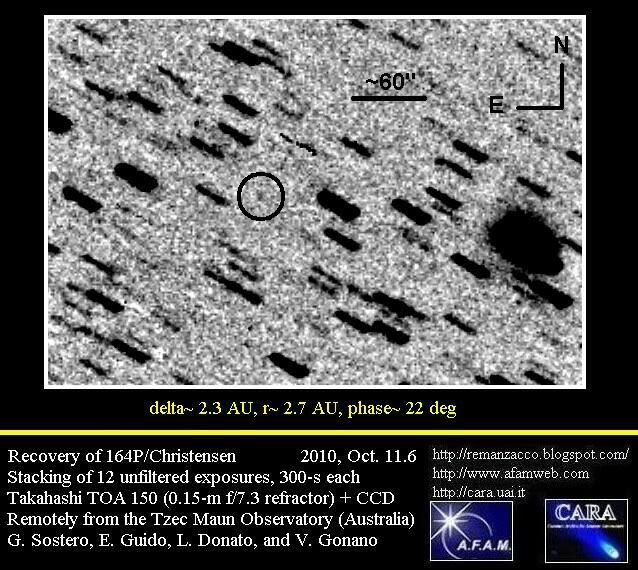 2012-X37, issued on 2012 Dec. 9, reports the discovery of the asteroid 2012 XE54 (discovery magnitude 17.3) by Catalina Sky Survey (mpc code 703) on images taken on December 09.1 with a 0.68-m Schmidt + CCD. 2012 XE54 has an estimated size of 20 m - 44 m (based on the object's absolute magnitude H=25.6) and it will have a close approach with Earth at about 0.6 LD (Lunar Distances = ~384,000 kilometers) or 0.0015 AU (1 AU = ~150 million kilometers) at 1004 UT on Dec. 11 2012. This asteroid will reach the peak magnitude ~13.0 on December 11 around 0600 UT. We performed some follow-up measurements of this object, from the H06 ITelescope network (near Mayhill, NM) on 2012, Dec. 11.3, through a 0.25-m f/3.4 reflector + CCD. 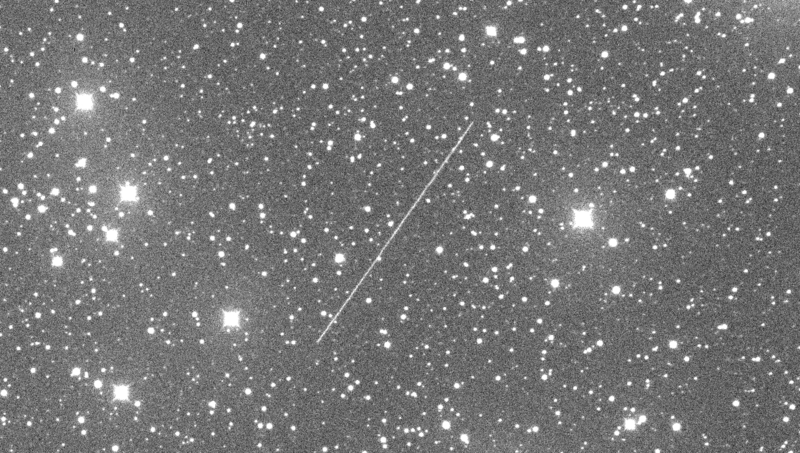 Below you can see our image, single 60-second exposure, taken with the asteroid at magnitude ~13.2 and moving at ~630 "/min. The asteroid is trailed in the image due to its fast speed. 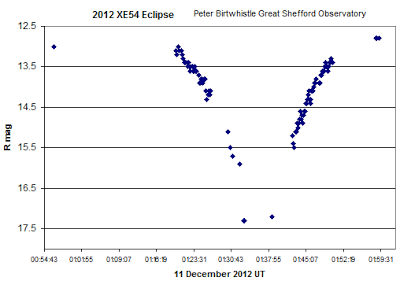 At the moment of the close approach 2012 XE54 will move at ~ 720"/min. Click on the image below to see a bigger version. North is up, East is to the left. According to calculations made on December 10 by P. Tricarico, 2012 XE54 "will likely cross the Earth's shadow, causing a partial eclipse of the asteroid a few hours before reaching its minimum distance with the Earth. Asteroids eclipsing during an Earth flyby are relatively rare, with the first known case of asteroid 2008 TC3 which was totally eclipsed just one hour before entering Earth's atmosphere over Sudan in 2008, and asteroid 2012 KT42 experiencing both an eclipse and a transit during the same Earth flyby in 2012". 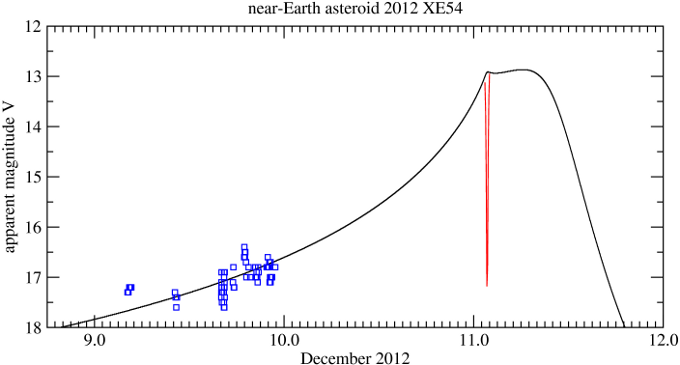 The plot below shows the expected average apparent magnitude of asteroid 2012 XE54 (line), the filter-corrected magnitudes reported (blue boxes) and the dip due to the eclipse (red curve). This prediction has been confirmed by observations made by Peter Birtwhistle (J95 mpc code). Peter put up a very preliminary lightcurve (see graph below) covering the eclipse earlier today, showing minimum centred around approx. 01:37:00 UT, probably around mag ~ +17.5. It is with deep sadness that we share with you the loss of our dear friend Giovanni Sostero. 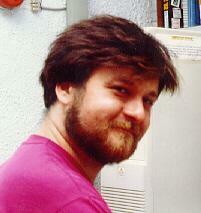 Giovanni was a great person, a great astronomer and above all the best of friends! A tribute to Giovanni on Universe Today website and on the Italian astronomy magazine Coelum (Page 1 & Page 2). 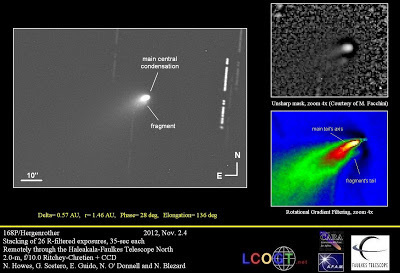 By clicking here you can hear the last audio interview (in Italian) by Giovanni to the "Istituto Nazionale di Astrofisica" (National Institute for Astrophysics), or INAF in occasion of our discovery of fragmentation of comet 168P on October 2012. 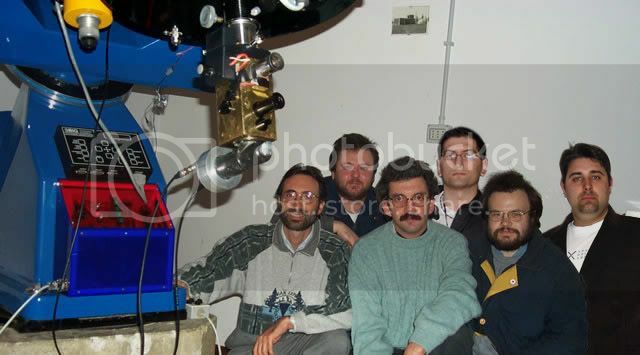 During the MEADOW 2013 workshop (MEtrology, Astronomy, Diagnostics and Optics Workshop) an award in memory of Giovanni Sostero will be attributed to a distinguished scientist in the field of metrology. 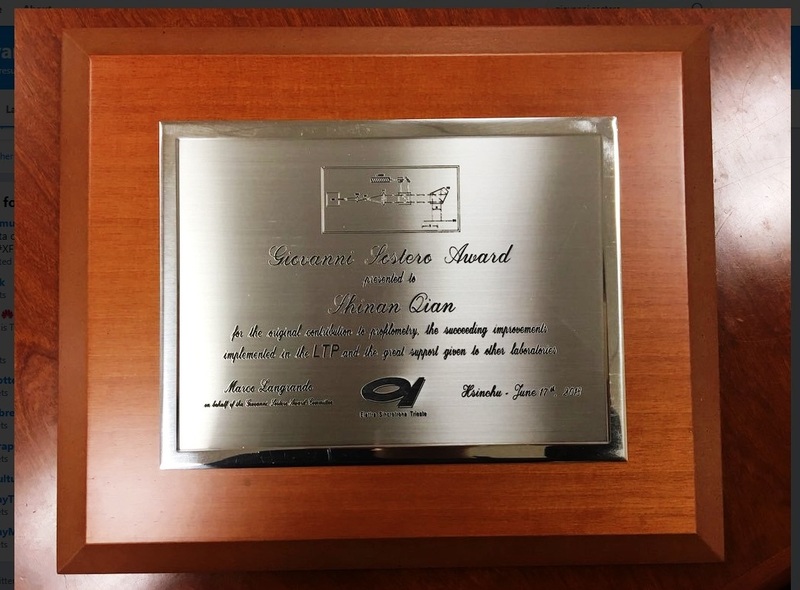 "The award would like to remember and honor Giovanni Sostero, formerly in charge of the soft x-ray metrology laboratory at Elettra, who sadly passed away in late 2012. The scientific activity of Giovanni, who was also extremely active in the field of astronomy, will be also illustrated through a dedicated presentation during the workshop itself, while the award ceremony will be held during the workshop dinner on the evening of October, 29th." The MEADOW 2013 workshop (MEtrology, Astronomy, Diagnostics and Optics Workshop) will be held in Trieste from the 28th to the 30th of October 2013, at the International Centre for Theoretical Physics (ICTP). 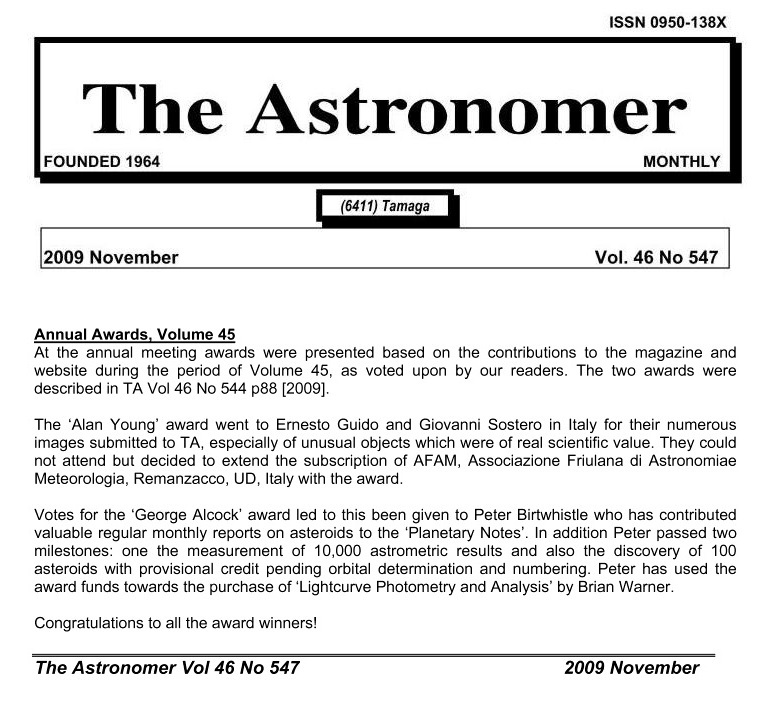 On October 29, during the MEADOW 2013 workshop (MEtrology, Astronomy, Diagnostics and Optics Workshop) held in Trieste, it has been assigned an award in memory of Giovanni Sostero to Peter Z. Takacs del Brookhaven National Laboratory, a distinguished scientist in the field of metrology (see previous update). 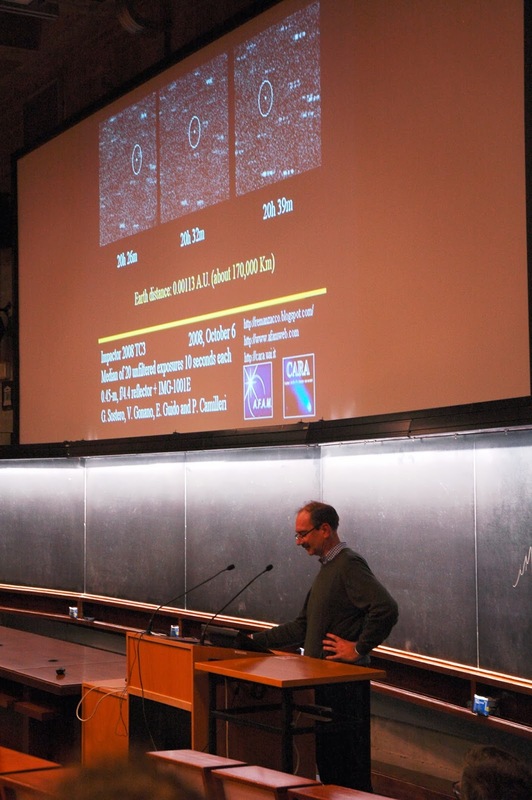 Before the award ceremony, Marco Fulle and Giannantonio Milani made two talks to remember Giovanni and his astronomical work. Below you can find some photos taken during the event (thanks to Martino Nicolini). Click on each image for a bigger version. 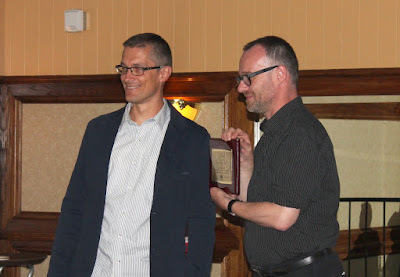 The "Giovanni Sostero" award has been assigned to scientist Frank Siewert in a ceremony during the 6th “International Workshop on X-Ray Optics and Metrology” which was held from July 14th–16th at Lawrence Berkeley National Laboratory in Berkeley, California USA. "Frank Siewert was honored in particular for his contributions on the development of latest metrology for Synchrotron Optics. 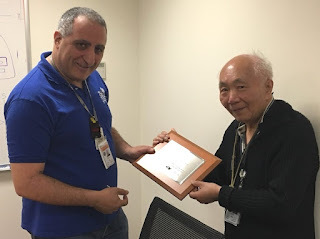 He has “pushed the limits of X-ray optics metrology to an unprecedented level and gave a collaborative and constructive support to the international community on metrology for X-ray optics” as the awarding committee pointed out." The award was established for the first time at the MEADOW workshop in Trieste (see previous update). The award is granted every 3rd year in memory of Giovanni Sostero who formerly was in charge of the Soft X-ray Metrology Laboratory at Elettra in Trieste. It honors scientists who contributed significantly to the development of the metrology for latest X-ray optics. 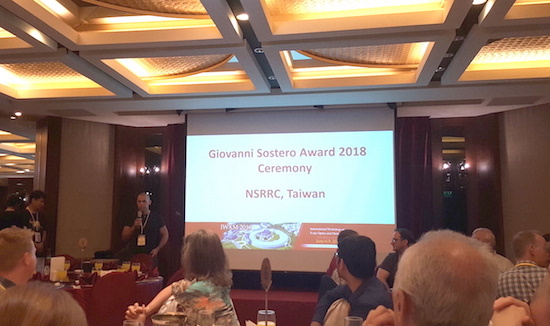 At the last International Workshop on X-ray Optics and Metrology (IWXM) workshop held in Taiwan on June 06 - 09, 2018, the award ceremony for the third “Giovanni Sostero Award” for Metrology was celebrated. "This year, the award – bestowed upon a distinguished X-ray Metrology personality – went to Dr. Shinan Qian of the Brookhaven National Laboratory. 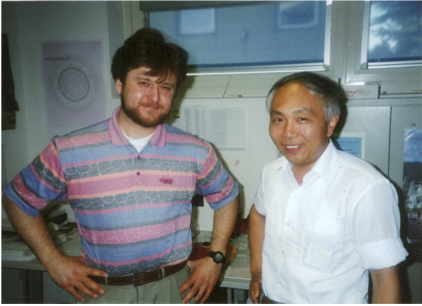 Dr. Qian was a collaborator and close friend of Giovanni Sostero (they are shown together in picture below)." The commemorative plaque was delivered to Dr. Shinan Qian – who could not attend the workshop – at his study in Brookhaven. Click on the images below for a bigger version (all image credit belongs to Elettra-Sincrotrone Trieste). M.P.E.C. 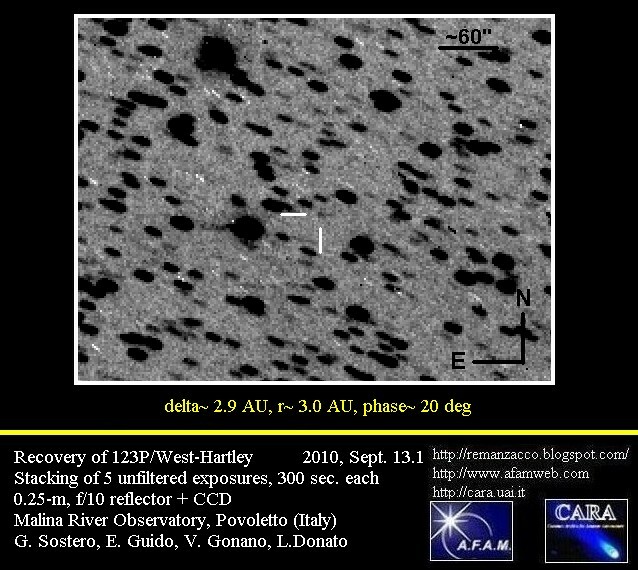 2012-X23, issued on 2012 Dec. 6, reports the discovery of the Apollo type asteroid 2012 XZ6 (discovery magnitude 15.4) by Catalina Sky Survey (mpc code 703) on images taken on December 05.3 with a 0.68-m Schmidt + CCD. 2012 XZ6 has an estimated diameter of 290 m - 650 m (based on the object's absolute magnitude H=19.8). On December 01, 2012 this asteroid had a close approach with Earth at about 41.6 LD (Lunar Distances = ~384,000 kilometers) or 0.1069 AU (1 AU = ~150 million kilometers). 2012 XZ6 reached the peak magnitude 15.9 during the period December 02-04, 2012. We performed some follow-up measurements of this object while it was still on the Neocp, remotely from the H06 ITelescope network (near Mayhill, NM) on 2012, Dec. 05.44, through a 0.25-m f/3.4 reflector + CCD and from and remotely from the Siding Spring-Faulkes Telescope South (FTS) on 2012, Dec. 05.58, through a 2.0-m f/10.0 Ritchey-Chretien + CCD. Below you can see our image, stack of 10x5-second exposures taken with the FTS, taken with the asteroid at magnitude ~16 and moving at ~16"/min. At the moment of the close approach on December 01, 2012 XZ6 was moving at ~ 19"/min. Click on the image below to see a bigger version. (North is up and East is to the left). Ernesto Guido & Nick Howes, for our friend/colleague Giovanni Sostero, who inspires us always. The planetary satellites can be distinguished into two characteristic groups: regulars and irregulars. Satellites are classified as “irregular” when their orbits are large, highly elliptical and tilted with respect to the equators of their host planets. In contrast, so-called regular moons, such as Earth’s or the large Galilean satellites of Jupiter, are characterized by small values of semi-major axis, eccentricities and inclinations. Moreover, most of the irregulars have retrograde orbits, which means they move around their host planet in a direction opposite to the sense of the rotation of the planet. While in contrast, regular moons have prograde orbits. Another important characteristic of the irregular ones are the family groups, i.e., satellite groups characterized by similar orbital elements. This difference can be traced directly to different modes of formation. Whereas the regular satellites grew by accretion within circumplanetary disks, the most plausible hypothesis to explain the origins of the irregular satellites is that they formed elsewhere and were captured by the planet from initially heliocentric orbits at an early epoch. While different capture mechanisms have been suggested (Gas drag capture; Pull-Down capture; Close-approach interaction captures; Capture of binary-asteroids) these bodies are still not well explained by standard models. Studying the origins of irregular satellites is an important piece in the development of the theory of Solar System formation. 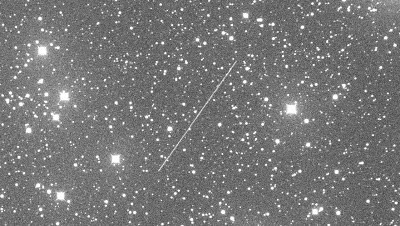 Yesterday we imaged 2 irregular satellites of Jupiter: Himalia (Jupiter VI) and Elara (Jupiter VII), both belonging to the "Himalia group". Images were obtained remotely, from H06 (ITelescope network near Mayhill, NM) on 2012, Nov. 22.34, through a 0.25-m f/3.4 reflector + CCD. Below you can see a diagram showing the semimajor axis scaled to the Hill sphere radius versus orbital inclination, for the irregular satellites of the giant planets known as of November 1, 2006. Also showed is the Himalia group with inclinations between 26.6° and 28.3°, and eccentricities of between 0.11 and 0.25. Below our image (stack of 10x60seconds exposures) showing both Himalia (magnitude 14.8) and Elara (magnitude 16.1). The bright light in the left corner is from Jupiter. North is up and East is to the left. Click on the image for a bigger version. By clicking here you can see the version without the windows zoom on the satellites. The graph below (elaborated on IMCCE website) shows the position of Jupiter satellite with respect to Jupiter at the moment of our imaging session. Himalia and Elara are the yellow marked dots. North is up and East is to the left. Click on the image for a bigger version. Zoom on Himalia & Elara. Click on the image for a bigger version. Ernesto Guido & Nick Howes, for our friend/colleague Giovanni Sostero, who inspires us always, waiting for his recovery. Cbet nr. 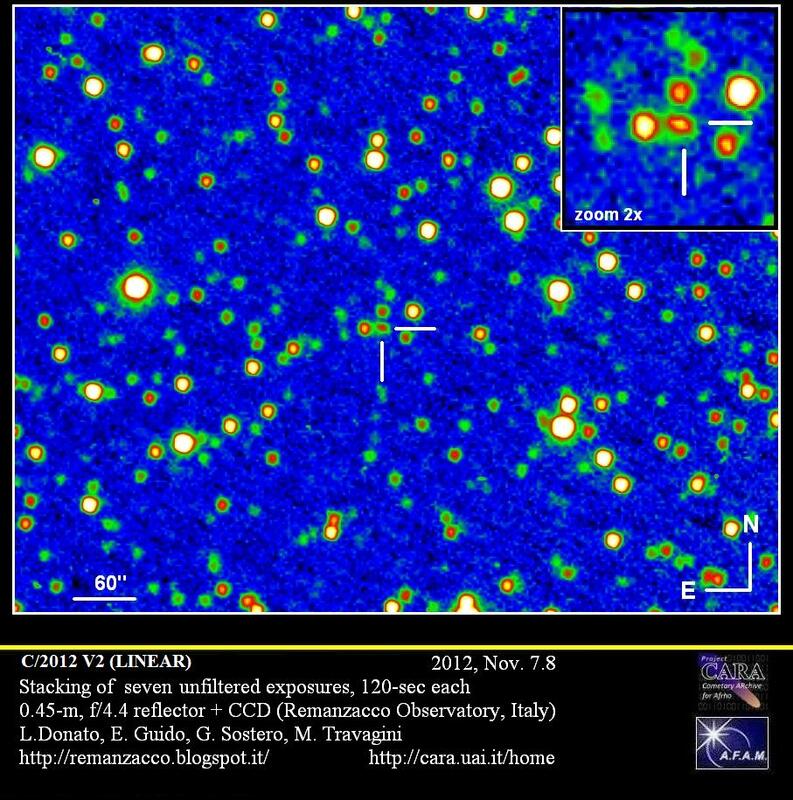 3290, issued on 2012, November 08, announces the discovery of a new comet (discovery magnitude 19.0) by the LINEAR survey on images obtained with the 1.0-m f/2.15 reflector + CCD on November 05.08. 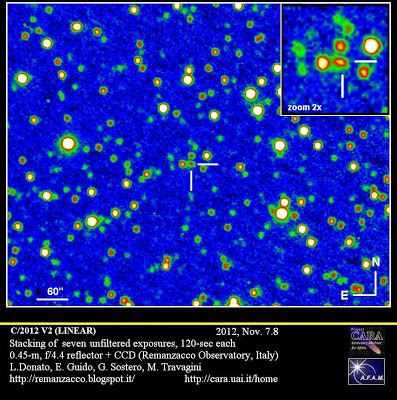 The new comet has been designated C/2012 V2 (LINEAR). We performed some follow-up measurements of this object, while it was still on the neocp. 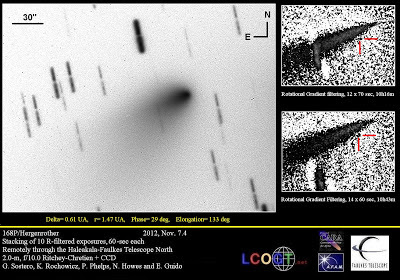 Stacking of eleven unfiltered exposures, 120-sec each, obtained at the Remanzacco Observatory (Udine) on 2012, Nov. 7.8, through a 0.45-m, f/4.4 reflector + CCD, shows that this object is a comet: compact coma about 10" in diameter. M.P.E.C. 2012-V58 (including prediscovery observations from the MASTER-II Observatory, Blagoveshchensk, Russia, on Oct. 30) assigns the following preliminary parabolic orbital elements to comet C/2012 V2: T 2013 Aug. 18.22; e= 1.0; Peri. = 217.77; q = 1.44 AU; Incl.= 67.43. 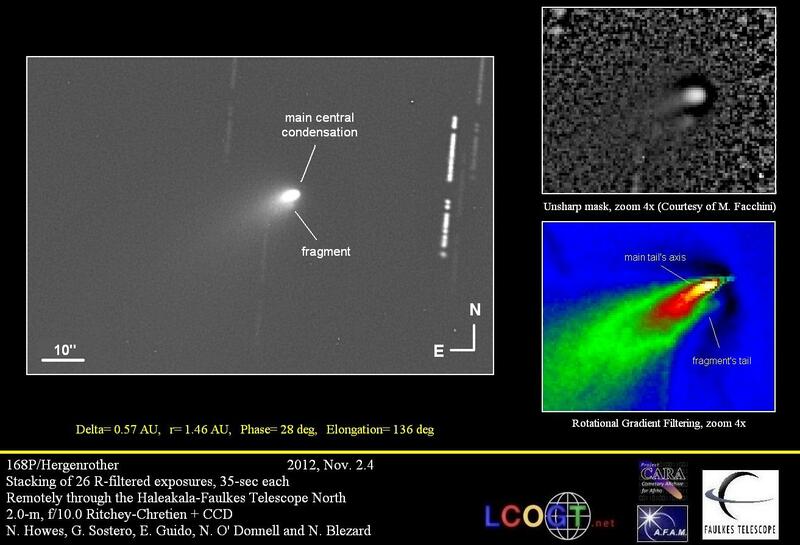 Following our team's detection of a fragmentation event with comet 168P/Hergenrother on October 26, 2012, we requested via the Faulkes Telescope Education project that further observations be taken. Today, two UK Schools using the Faulkes Telescope kindly assisted in obtaining additional observations for us. 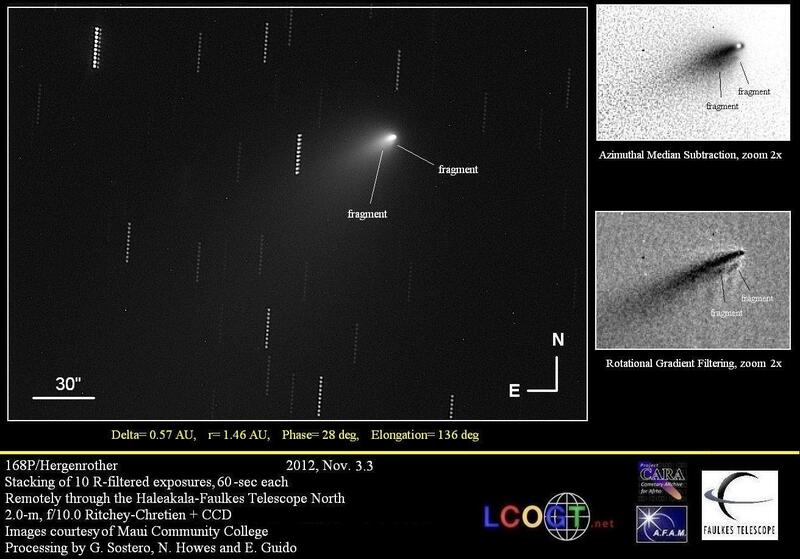 The two schools (Queens College and the Dollar Academy) performed follow-up observations of this comet on 2012, Nov. 2.4, remotely through the 2m, f/10 Ritchey-Chretien + CCD of Faulkes Telescope North (Haleakala). Stacking of 26 R-filtered exposures, 35-sec each, obtained remotely, from the Haleakala-Faulkes Telescope North on 2012, Nov. 2.4, through a 2.0-m f/10.0 Ritchey-Chretien + CCD, under good seeing conditions, confirms the presence of a secondary nucleus, or fragment, now placed about 3.3" in PA 165 with respect to the main central condensation of comet 168P. This fragment is now fainter, compared to our previous Oct. 26.4 detection, having R magnitude about 18.7; its diameter is still about 2", but now it appears more diffuse, without a clear central condensation (this hampers a precise determination of its photocenter). This fragment appears to have developed its own tail, nearly 4" long in PA 113 (about parallel to the main tail originating from the central condensation of 168P). Below you can see our rendition of today imaging session. Through some image processing, the tail of the fragment became easily visible. Click on the image for a bigger version. Below you can see an animation obtained using the school's imaging frames. (North to the top, East to the left). The animation covers about 25 minutes in total. Click on the thumbnail for a bigger version. 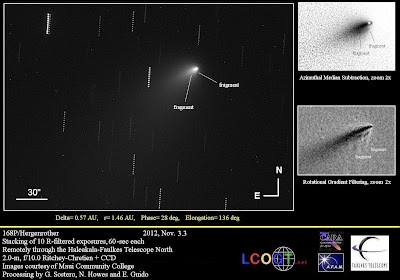 A blog entry (posted on their blog on Oct 31st) by the WIYN telescope group, who were testing the new ODI instrument, showed the comet with the fragment clearly. Below you can see their image obtained on October 30. 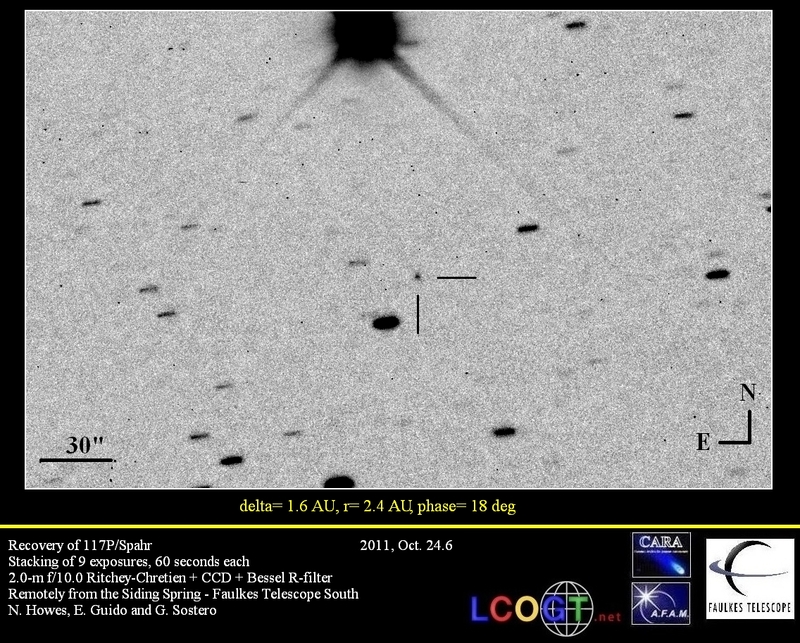 Our team would like to thank Queens College and The Dollar Academy (Adam Shannon) for their superb observations and we have included them in our submissions to the minor planet centre (PI at each school) and will reference their inclusion in our ongoing project to look at the dust/continuum values of this very interesting cometary event. 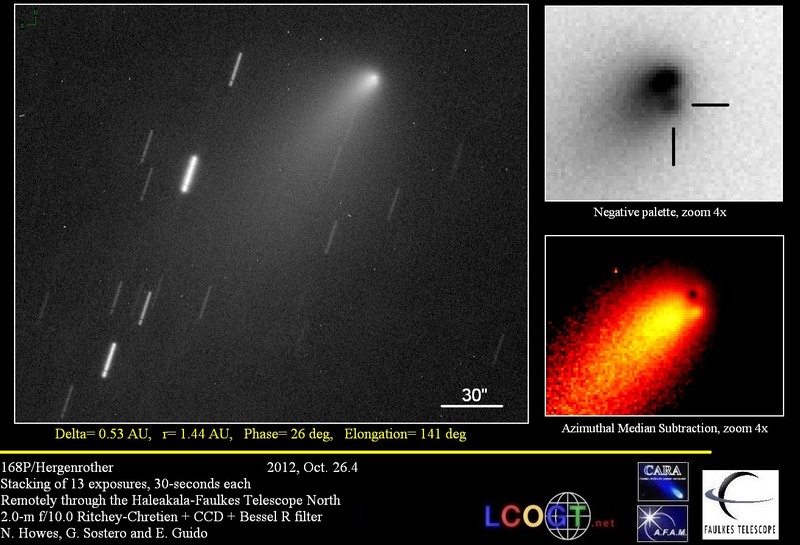 After the publication of our post with the discovery image & info of the splitting of comet 168P, the news spread and some of the largest telescopes in the world were pointed to the comet. 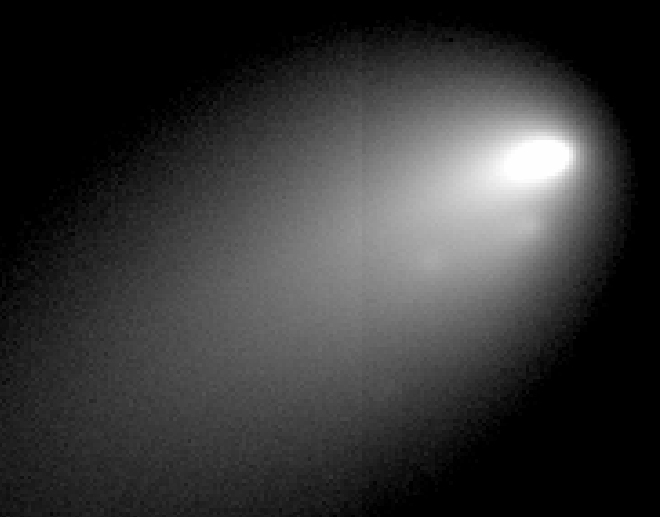 On JPL website has just been published this image captured by the 8.1m NOAO/Gemini North telescope on Nov. 2, 2012 at about 6 a.m. UTC and showing in great details the near nucleus area and "at least four distinct pieces". 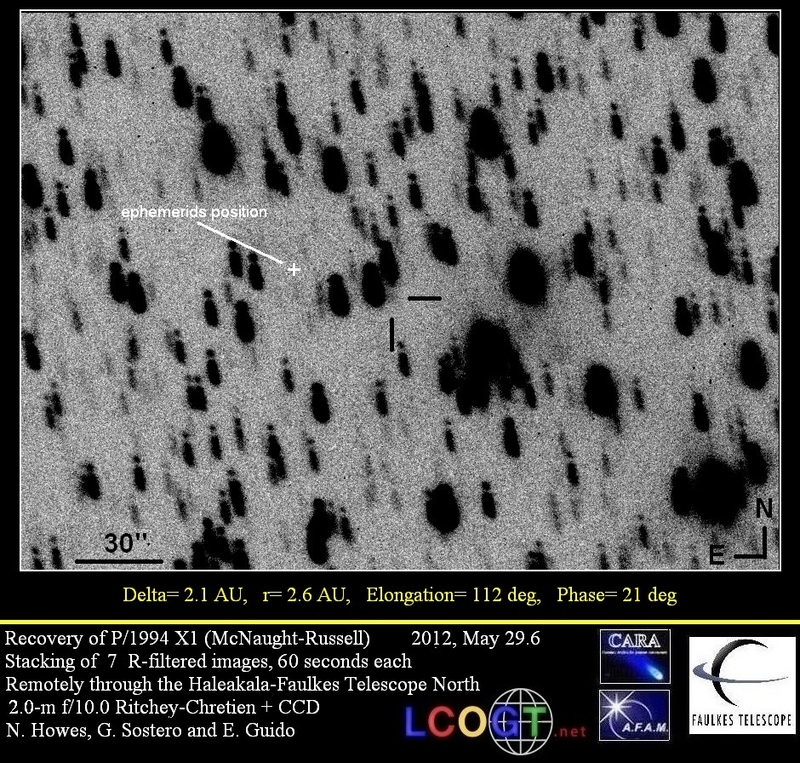 Below you can see our rendition of a series of images obtained by Maui Community College on 2012 November 03, through the 2-meter Faulkes Telescope North. Click on the image for a bigger version. 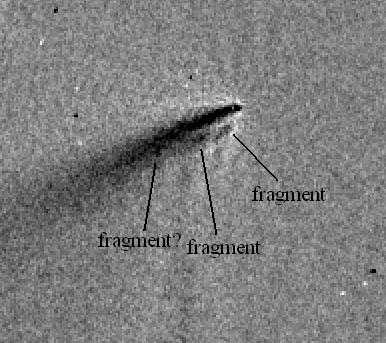 The fragment we found Oct. 26 appears increasingly weak and undefined, while it is maintaining its tail. 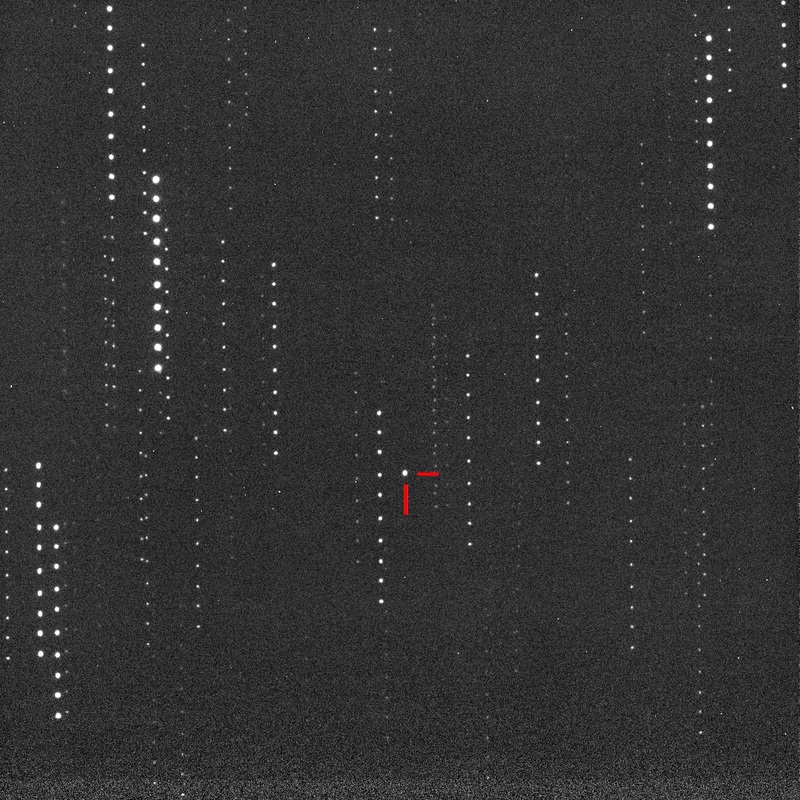 A second fragment, observed by the Gemini North, is possibly visible in this image too, though he is just above the noise level of the image. Please see the following image (image processing by Mauro Facchini). After some significative image-processing, in the stacking below there might be some evidence of a possible third fragment, tailward of the previous two (about 13" in PA 120 respect the central condensation of the comet); however its reality has still to be confirmed, due to its low signal/noise in the original images, so further follow-up on it it's needed to confirm or discard its presence. Today the "Istituto Nazionale di Astrofisica" (National Institute for Astrophysics), or INAF for short published a short summary of the splitting event with an interview with our team's Giovanni Sostero on the 168P comet story (in Italian). Comparison of two consecutive sets of images counting, respectively, twelve R-filtered exposures, 70 seconds each, and fourteen R-filtered exposures, 60 seconds each, obtained remotely (by G. Sostero, K. Rochowicz, P. Phelps, N. Howes, E. Guido), from the Haleakala-Faulkes Telescope North on 2012, Nov. 7.43 and Nov. 7.45 under not good seeing conditions, through a 2.0-m f/10.0 Ritchey-Chretien + CCD, shows that the fragment we reported on Oct. 26.4 and Nov. 2.4 now is not visible anymore (limiting magnitude about 20). On today's stackings, we noticed, instead, the possible presence of a second, extremely weak, fragment, having R about 19.5, placed nearly 8.4" in PA 142 respect to the main central condensation of 168P. 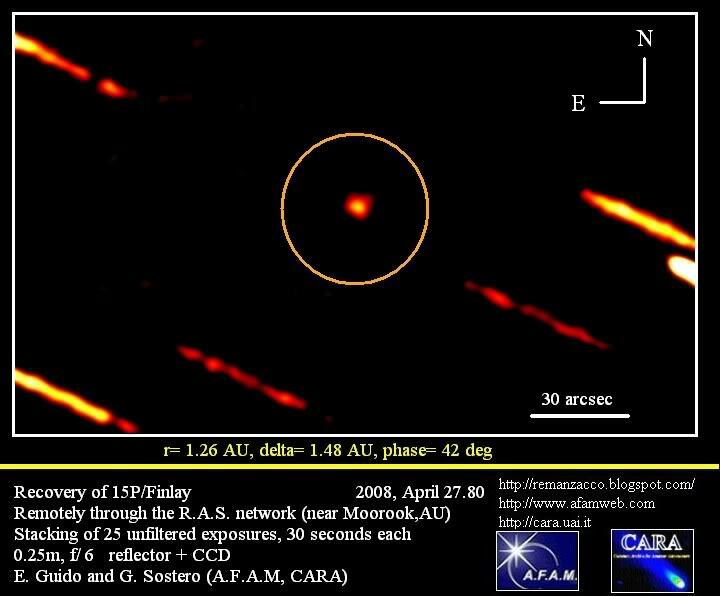 This second fragment appears to be visible, in nearly coincident positions, also on images obtained by R. Stevenson through the Gemini North telescope on 2012, Nov. 2.25 and on stackings obtained by the Maui Community College at the Haleakala-Faulkes Telescope North on 2012, Nov. 3.3. Due to its extreme faintness, we were prevented to calculate any reliable astrometric position for it, on the stackings we obtained today. Moreover the central condensation today appears a bit fuzzy and wider compared to four days ago (see image below; click on it for a bigger version). We will perform further follow-up to verify that this evolution is genuine, and not an effect of temporary bad seeing conditions.